After a one season hiatus it was great to see Illaunmore pheasant shoot back again for 2104. Owner Michael Mahnke had some health problems sorted out and it was good to see him in such fine fettle. I have written a lot about this unique island shoot over the years and everything I have said is always justified. 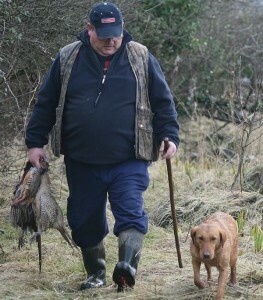 It has plenty of birds, a great athmosphere amongst the dogmen, helpers and the guns. A Typical Tipperary welcome is extended at all times. Knocknagow and the Homes of Tipperary and all that. A generous crowd except when it comes to the hurling! As well of course the trip to the island on the little ferry, ably piloted by Francis Devanney, is always a special occasion. Then there are the drives by the lakeshore where the guns have great freedom to shoot plenty of wide crossers. The partridge over the open meadows are high, fast and elusive. Then there is the shoot lunch – a four course culinary delight that is topped with an Irish coffee for those who might wish to indulge. In late November, we had a brilliant day’s shooting on Illaunmore. On that day, our host was that affable and outstanding sportsman, Michael Walsh – a man well known in road construction and other business circles in this country. Michael has stood at a peg in practically every driven bird shoot on this island. He is a true sportsman in every sense of the word. Using a combination of my George Bate and 32 gramme Eley Grand Prix HV No. 6, I had some fine shooting in the first couple of drives. On the other hand, when I experimented with the Damascus barreled Atkinson and Griffin and High Pheasant 30 gramme No. 7 from Hull with relatively high birds at a peg, in open ground, in the third drive, my success rate was not quite so good. Always blame the gun! Over the years, the iconic Illaunmore shoot has seldom failed to please. The birds are always there, the partridge fly strongly, and some of the drives beside the water’s edge provide shots, that are not available anywhere else in the country. Without hesitation, I would say that the dogmen and woman, because Sally St. George is ever present, are extremely helpful and anxious to please. Led by the Keeper, Vincent Kyne, people such as Mikey Ryan, Noel Tomlison, Joe Hogan, Joe ryan, etc. often go out of their way to help and advise and this is greatly appreciated. There is no cynicism there. On that day in late November, seven guns had a bag of 235 head of game for a marvellous day’s sport. Copyright © 1997–2017 Illaunmore Ltd. All Rights Reserved.